In ground removable bollards are ideal for protection against ram raids whilst providing ease of access during trading hours. Andian Sales has refined its range of in ground removable bollards. The in ground removable bollards range provides for two choices of locking mechanisms, the first provides a latch whereby the users attach their own padlock when the bollard has been positioned into its in ground sleeve. The second is an all inclusive top locking bollard which is supplied with two keys and is easily removed by the operator inserting and turning a key into the bollard, and lifting it out of its in ground sleeve. The mechanisms on both bollard options include a hinged steel lid feature, which when the bollard is out of its sleeve, the lid can be flipped over to cover the cavity thus stopping debris falling into the sleeve. If your application requires the in ground removable bollards to be flexible, Andian Sales has developed a flexible insert which will allow the bollards to be hit by vehicles and when this occurs, the damage to both the vehicle and the bollard is vastly reduced. 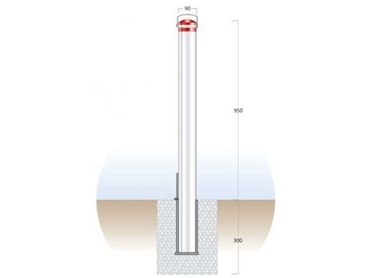 Product specification – TLB ECO-1 All Inclusive Top Locking bollard is round in shape, made from mild steel, it has a height of 950mm, diameter of 90mm and it weighs 14 kg.